Is JinniLotto a Scam or Legit? Read 10 Reviews! JinniLotto Exposed — Could Your Winnings Go Up In Smoke? Looking at Jinnilotto.com, the “Jinni” logo puts a smile on my face. How could you not love a little blue man? Okay, it made me think of magic lamps and wishes. This is an online lottery provider offering the individual lottery tickets plus EuroMillions syndicate. Back to the Jinn, course my first wish would be to win a lottery. Could JinniLotto.com be the place? 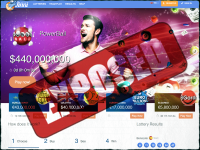 Jinnilotto.com offers 10 international lotteries including US Powerball and EuroMillions with quite a few of the European lotteries. Lottery tickets can be purchased from 1 to unlimited either using your favorite numbers or Quick Pick. Multiple plays are discounted by 4 draws/4%, 8 draws/10% and 26 draws/15%. There is no information on when the amount is charged to your credit or debit card and/or what happens if you close your account say if you take the never miss a draw option and then cancel a week later. There is one syndicate or group option at Jinnilotto.com – EuroMillions. The syndicate owns 50 ticket lines. Players can purchase 1, 5 or 10 shares. But seriously – only 50 ticket lines. The numbers are chosen for you and are random. They don’t follow a set pattern like the same base numbers with the bonus ball, changing for each ticket. Once all shares are sold a new syndicate starts. The same discounts as buying single tickets apply. For winnings under US$ 1000, Jinnilotto will not take any commission. For winnings over US$ 1000, they say “company shall charge a commission of 10%”. They also say, they will be responsible for assisting in collecting the winnings, but in some cases a lottery operator may require to collect your winnings in person. Okay folks – once again there is the ole Frequent Purchase Points (FPPS) that add up to a variety of tiers of discounts ranging from Bronze through to Diamond. Like I really want to know how much I’ve spent on lottery tickets! There isn’t any info on how this discount works with the other discounts offered in purchasing multiple draws. So what we figure is the more tickets purchased and the higher the tier, the harder it is to get to the next level because of the discounts. Does that make sense? Jinnilotto.com is owned by Jinni Tech Limited (Company Registration Number: C 72030) and is powered by LottoYard. Their office is located office is located at 7A, Sir Luigi Camilleri Street, Sliema, SLM 1843, Malta. There is 24/7 live support, email and toll-free numbers. Seriously folks – this is simply yet another lottery that is charging an additional fee on top of the face value of lottery tickets for the service of buying them locally for you. The team can’t give these folks a thumbs down at the same time, we couldn’t figure out any added value of why to play here. Please leave your reviews and tell us about your experience of playing the lottery on JinniLotto.com. I have filled application ETC and it won’t let me go to step 3. Constant unwanted calls to my house. AVOID! Once again. This is dodgy as he’ll. 3 emails trying to sort this out. And the piss poor service couldn’t even be bothered to put my tickets on for Tuesday night. Service is so bad that I can’t even get a reply. So I’ll be putting their terrible customer service on social media I think. Dodgy dodgy dodgy. I haven’t had so many issues with any online lotto as I have with this. Pick my own numbers and it won’t finalise payment. Still to this day I have not seen the numbers I have picked posted as my ticket. Try to use a small winnings to play on. And again it won’t let me pay out of the winnings or let me play my chosen numbers. Or I cannot see my ticket until the next day after it was drawn. Very disappointed. Try to call with no reply. Get a call back then get cut off. Be aware and don’t invest in Jinni lotto. Big scam. Still waiting for a compensation back from the big scam. They did to me. They never delivered what they promised and still receiving calls from them for me to invest money. It is a joke. Richard joined Jinnilotto like all of our customers, to play Lotto. As we all know, Lotto is all about Luck and numbers. We offer our customers different packages and deals to increase the exposure and amount of tickets. We never promise our customers that these tickets are the winning tickets. I am not sure why Richard is saying that we did not invest his money correct, this is not the stock market. We also offered some free tickets as an act of a good faith. As I mentioned in all my emails to you Richard, we want to help to close the gap between us. Jinnilotto appreciates your business and hopes we can see you playing again. JinniLotto took money from my account, I asked for it back wasn’t forthcoming! The online support doesn’t answer. According to our records and call logs, you agreed to purchase the package. I am sorry if you had little winnings but it is not in our control. Here at Jinnilotto we care about our customers and set up the package cost according to their financial status. Once a package of tickets is purchased and played, it is impossible to refund the money. Jinnilotto appreciates your business very much. JinniLotto took money from my account, I asked for it back wasn’t forthcoming! I told her I can’t afford I want money back! Have closed my account off and have nothing. Took 45.86 out of my visa debit account I want it back! Thank you for the review, we believe that reviews help us improve. Once you agreed to play and purchase the package, the tickets were already purchased and uploaded to your account. We did close your account right after that and your card was not charged again. Thank you for your business and I hope to see you playing ith us in the future. Awful customer service. I requested to cancel my subscription, and they charged me again. Scammy company! Unfortunately, when you asked to cancel your subscription the second package was already purchased and the tickets were already in your account. Once we received your request we canceled your subscription. Awful customer service. They never respond on time. Very poor customer service. After numerous attempts to reach you on the phone number you have registered with, we emailed with no response. It is hard to help someone without the ability to contact them. Please call us with a valid number so we could resolve the issue. I played the Mega Millions draw from Canada. Thank you for your business Thomas!